"MIRRACHROME, GHOST CHROME, & CRYSTAL FX"
Besides realistic fire, the hottest thing hitting the kustom market is the use of Ghost Chrome, Mirrachrome, and a number of the new hyper-metallics available to kustom painters today. 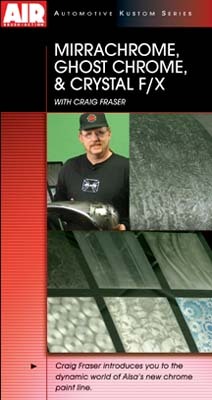 In this video, Craig Fraser covers the use of the top products manufactured by ALSAcorp, and how to get the most out of them. Including underpainting, stencilling, and grinding effects.